This torrid Saturday, Al Numeira was acting tour guides for about 150 people in Wadi Numeira. The event was organized in cooperation with GIZ (German Society for International Cooperation) and Johud (The Jordanian Hashimite Fond for Human Development), in connection to this week’s celebration of German-Jordanian friendship relations. 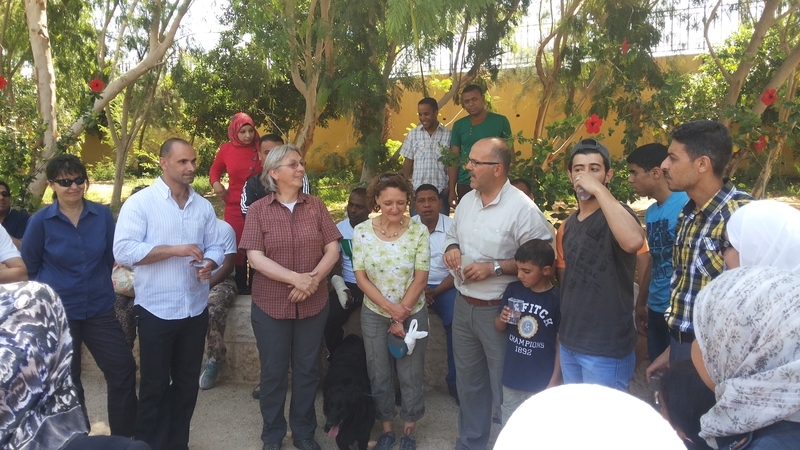 The group consisted mainly of Jordan families, students and NGO workers as well as native Germans that are seated in Jordan for one reason or another. After a busy gathering in the public park in Ghor Haditha, a caravan of buses headed to the Museum of Lot’s cave for a short stay and then on to the Wadi Numeira. While cooling our feet in the water stream, we experienced the fascinating nature together and got a chance to exchange experiences and thoughts on the current environmental situation in the Ghor. The team of volunteers from Al Numeira divided themselves, as to be able to guide small groups of the visitors in the Wadi. Al Numeira also made sure that the site was left clean, which didn’t take more than ten minutes of clean up but produced about a dozen filled up litter bags. It would be a great benefit to wadis as well as most other natural sites in Jordan, if easy clean ups like this one became standardized. Al Numeira is just in the starting point of eco tourism events and this tour was for us a very useful experience that we can now draw on further. We would like to thank our courageous local team for participating and sharing their knowledge in this new and somewhat challenging situation. We would also like to send a big thanks to GIZ and Johud, who have been very ambitious in their planning and organization and not to forget, provided delicious lunch.